Please go to the contact page and forward your request along with a clearly dimensioned drawing of your requirements and any relevant details such as knockoiuts required for sinks or hobs and your location. Can I have any size concrete countertop? Each of our countertops is bespoke and cast in-situ which means we can create any shape, size or length seamlessly without joins. This includes the inclusion of floor return panels. Are off-the-shelf kitchen units strong enough to support a w+r concrete countertop? Our standard 55mm thick concrete countertop weighs approximately 125kg per m2 and standard off-the-shelf kitchen units can easily take this load. Kitchen units need to be fixed to each other as well as the back wall. Island units can suffer from twisting so we advise that these designs are secured to the floor and further supported beneath the base units. How does w+r make a concrete kitchen countertop? We create a mould or formwork around the kitchen units then pour, trowel, polish and seal the countertop on site. Casting in-situ means there is no need to template the design first. Please contact us for more information and a copy of our Concrete Countertop information pack. What choices of finish and colour are available? All flat surface work is hand trowelled to a lightly burnished, natural finish. A wax polish is usually applied to enhance the natural luster and sheen but this is optional should a matt surface be preferred. We also offer a ground or exposed aggregate finish. Vertical or cast surfaces can vary from smooth to board mark timber finish depending on the material used for the formwork face and the aesthetic requirements. We offer a basic range of three colours: Natural non-pigmented grey, standard pigmented black or charcoal and antique white. Variations on these three are available along with non-standard pigmented tones on request. We produce a square edge profile as standard with a 2mm arris edge. Will my polished concrete countertop be waterpoof? At w+r we use a penetrative sealant which is designed to allow the concrete to breathe. It functions as a resistant aginst absorbtion of liquids rather than an absolute barrier. A subsequent application of a cream polish provides additional waterproof properties promoting the beading of liquids on the surfaces. If water is absorbed into the surface the breathable qualities of the sealant will allow the surface to dry out. Do I need to look after my white+reid countertop? Concrete, like any natural stone or wooden countertop, does require looking after. Whilst we provide you with a fully sealed and waxed countertop that is resistant to staining, the sealant is not an absolute barrier and we do strongly advise that any wine or acid based liquids are wiped off the surface as soon as possible. The surface should be wiped up as you go and should be cleaned with non-aggressive or bleach based cleaning products. Please contact us for further details on general maintenance of our concrete surfaces. The beauty of concrete as with wood or natural stone is that the surface is enriched and enhanced over time with regular maintenance. Can I prevent the polished concrete surface from staining? Although we seal our polished concrete countertops to help prevent staining, it is important that any food or drink spillages are cleaned from the surface and not left for long periods. Re-applying the cream polish regularly will also help resisit staining and help to keep it looking its best. Regular reapplication of the selant would also help maintance the stain resistant qualities. As a guide this should be done yearly but depends on use. How can I remove stains if they occur? We can advise on stain removal and where to purchase stain removal products. If required, concrete can also be stripped back to the bare material then cleaned, re-polished, sealed and waxed. Please contact us for further details. Does white+reid offer a maintenance programme? We do offer a maintenance service for all of our polished concrete products. We can also advise our clients how they can maintain their concrete surface themselves. How much does a white+reid concrete countertop / worktop cost? As each w+r concrete countertop or surface is unique, we require a dimensioned plan drawing along with any relevant information such as project location to give an accurate costing. Please contact us for a non-obligation quotation. Where can I view some of your polished concrete work? 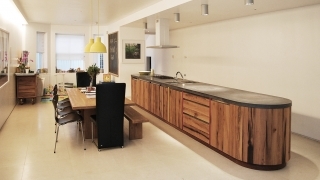 Examples of our polished concrete countertops can be seen at Roundhouse Showrooms in Central London and Cheltenham and samples of our concrete are held at SCIN Gallery in London. Where possible we can arrange for prospective clients to view our work in current or past clients' properties. Does white+reid undertake polished concrete repairs and refurbishments? Yes, we carry out repair and refurbishment of our concrete surfaces and products should it be required. Do white+reid make polished concrete splashbacks? Yes, we make either cast or hand trowelled splashbacks, however there are restrictions to the sizes. Please contact us for further details. Do you work throughout the U.K? Yes, but since all our work is carried out in-situ, travel, accomodation and subsistence costs need to be added to the quotation. Please ensure that the project location is provided when requesting a quotation.